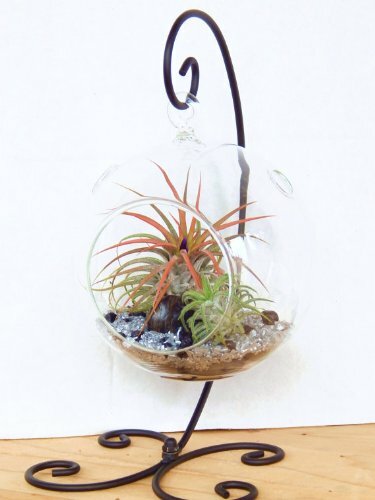 This beautiful terrarium is sure to add that decorative touch to someones home. Air plants are very easy to care for and are beautiful specimens to watch grow. The glass terrarium will include the whimsical black stand. Air plants need bright indirect light and dunk them in water 1-2 times a week. In more humid environments, such as bathrooms, watering may not be required as often. A great plants for anyone, even the people with 'The Black-thumb'! !This kit listing will include the following:1- Round glass globe terrarium 5.5 x 5"1- Black metal stand2- Air Plants 1 Large and 1 small- assorted (may or may not be in bloom)1- Bag of black/silver sand and rocks mixed1- Detailed care sheetYour order will be packaged in a way to keep everything intact and safe. It will be shipped in a brown box. Depending on how cold it is a heat pack may be included to avoid any damage to the plant. If you are buying this as gift for someone, please include a message in your check out and I will add a small card with your message to the recipient in the order. If you have any questions about this product by Bliss Gardens, contact us by completing and submitting the form below. If you are looking for a specif part number, please include it with your message. Largest Jumbo Size Glass Globe Terrarium! 9 inches tall!